Before there was Tarzan, there was John Carter. But while author Edgar Rice Burroughs' lord of the jungle has remained a recognizable icon since his debut in October of 1912, the planet-hopping swashbuckler that kicked off his writing career earlier that same year hasn't fared as well. Once almost as well known as Tarzan, Carter is now more of a cult figure, revered mainly by dedicated science fiction and fantasy enthusiasts. There have been attempts to make a film based on the John Carter series as far back as the thirties, but none have come to fruition until now. Well, that's not entirely true. In 2009 The Asylum made one of their direct to video “mockbuster” adaptations of the property, but more on that later. Director/co-writer Andrew Stanton still earns the distinction of being the man to finally bring John Carter to the big screen. 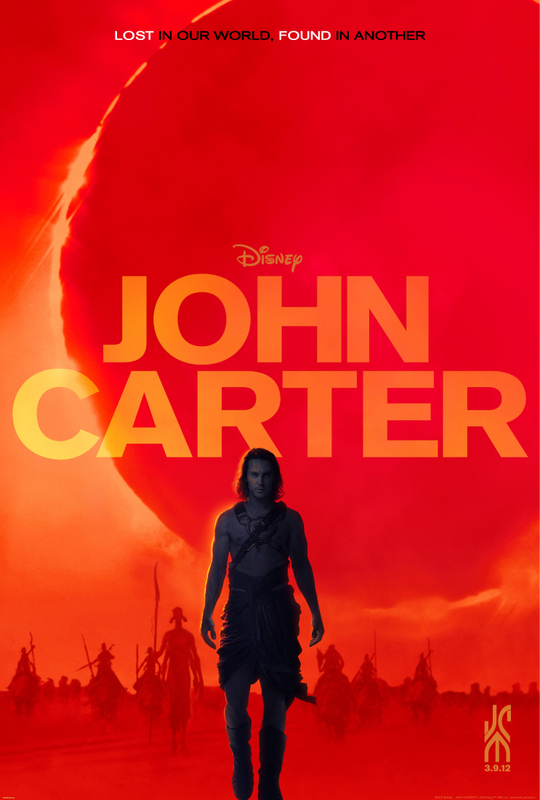 JOHN CARTER is based on Burroughs' A Princess of Mars, the first book in the series, and with Stanton's track record at Pixar (he's worked in a major capacity on almost all their feature films, and directed FINDING NEMO and WALL-E), I saw reason to hope he might do justice to the classic “planetary romance”. And I was really hoping he would, since the John Carter books were among the first adult(ish) sci-fi/fantasy novels I read way back when I was about 12 years old. 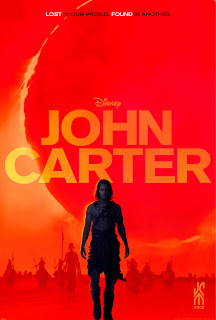 The more natural opening comes after the credits as we meet world-weary Confederate army veteran John Carter (Taylor Kitsch) as he sends a cryptic telegram to his nephew Edgar Rice Burroughs (Daryl Sabara) in a gimmick carried over from the books. Young Edgar shows up at his Uncle's estate only to learn that the man has died and left him everything, including a journal recounting his many adventures. It is through the journal that we learn how Carter was transported from earth to the red planet we know as Mars and which its native inhabitants call Barsoom. There are several different races on Burroughs' Barsoom, three of which we meet in this film. Carter first encounters the 15 foot tall, four-armed “noble savages” known as the Tharks, led by Tars Tarkas (Willem Dafoe). Rather than kill Carter, the Tharks take him captive as a sort of curiosity. Barsoom's lesser gravity gives the earthling the ability to jump really high and imbues him with considerable strength, which Tars Tarkas finds fascinating. Later, Carter is pleasantly surprised to encounter the red skinned humanoid Dejah Thoris (Lynn Collins), the princess of the original novel's title. She's a warrior, scientist, and politician as capable as any man. Nonetheless her father has offered her in an arranged marriage to bad guy Sab Than (Dominic West) in order to stave off war. Finally, there is a white race with powers that may be divine or merely a higher form of technology known as the Therns. Their chief representative and the film's secondary bad guy is Matai Shang (Mark Strong). Although there are changes both big and small to the novel's plot, Stanton's film manages to incorporate the vast majority of its major events. While some might have felt it wise to perhaps shave off some of the more minor elements for the sake of streamlining the tale, Stanton and his co-writers have gone the other direction. They've added additional subplots both original (giving Carter, a mysterious solitary man in the books, a deceased wife and child back on earth) and from later books in the series (the Therns don't figure into events until the second book, and have no connection to the plot of the first). The result is that a story which was already pretty complex becomes even moreso to the point that it's unnecessarily cluttered and devoid of flow. Also, by trying to cram so much plot into one two hour film the movie sacrifices a great deal of the spirit and themes that were present in the books. The novels are extremely concerned with honor, courage, and loyalty, and the way people of different cultures can learn to respect each other through these traits. This factors in to both the romance between Carter and Dejah Thoris, and Carter's friendship with Tars. Here, the relationships between characters seemingly shift in the blink of an eye for arbitrary reasons with little to suggest they had even heading in that direction. Whatever it takes to move the unwieldy plot forward, I guess, themes and character development be damned. Carter is presented in the film as the classic reluctant hero in the Harrison Ford mold with a bit of Eastwood's Outlaw Josey Wales (particularly the back story) thrown in for good measure. I don't know whether to blame Kitsch, or if it's the script and/or Stanton's direction, but on screen he has neither Ford's cocky charisma nor Eastwood's imposing presence. Collins' Dejah Thoris is pretty and can hold her own in battle with the male characters, but despite that she still comes across as rather bland. A compelling villain might have given the film the life it so desperately needs, but West, an actor I usually like and who has done memorable bad guy work in the past (he was gloriously over the top as Jigsaw in PUNISHER WARZONE) is just as flat as everyone else in the cast. Part of it is his performance (or maybe Stanton's direction of it), but at least some blame goes to the inclusion of the Therns as secondary villains. Their presence detracts from any impact West might have made by diminishing his screen time and the importance of his character. Ironically it's the CG characters who make the biggest impression, particularly Dafoe's green man and a six legged Barsoomian dog named Woola that takes a liking to Carter. But the movie is called JOHN CARTER, not TARS TARKAS AND THE GIANT SIX LEGGED DOG THING. Stanton fares best with the film's action sequences, and there's at least one that's a textbook example of visual storytelling. Carter is single-handedly taking on a horde of the giant savage green men. As he fights, the film cuts back and forth between the battle and Carter's memories of returning home from the Civil War to discover the fate of his wife and child. This is about the only scene that elicits any real emotion, and it shows that Stanton did have the potential to make this into something special. Unfortunately, it's the only scene that rises to that level. In terms of visually depicting the most imaginative aspects of Burroughs' creation, the special effects artists and set designers do a commendable job. That said, as low rent by comparison as The Asylum's 2009 PRINCESS OF MARS adaptation of the same story was, I actually enjoyed it more than this 250 million dollar epic.